Two series of Al sheets are coated with different thicknesses of copper-deposited film from 10 to 40 µm by the electroplating technique. The first group is the fresh cast Al sheets, and the other is the recycled water-atomized Al powder prepared by the technique of powder metallurgy. Microstructure and phase structure were examined by XRD, optical microscopy and FESEM. Electrical conductivity, thermal conductivity and coefficient of thermal expansion (CTE) were investigated. The XRD showed that only Al and Cu peaks appeared for the cast Al sheet samples, but for the recycled ones other peaks corresponding to Al2O3 were also detected. The microstructure indicated that the coated Cu layer had a dendritic structure in a continuous pattern, but for the recycled samples the dendritic structure was not clear but continuous. Both the thermal and electrical conductivities were gradually increased along with the increase in the Cu thickness, while the CTE was decreased. 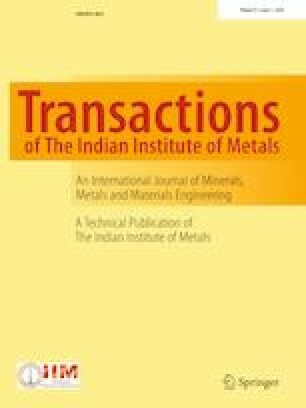 The authors wish to thank the researchers and the technicians of the Central Metallurgical R&D Institute (CMRDI) in Helwan, Faculty of Industrial Education—Helwan University, Cairo, Egypt—and CAMC for their cooperation. Ait J H, Liu S P, Widharta N A, Adhikari S, Anderegg J W, and Hebert K R, J Phys Chem 115 (2011) 22354. https://digital.library.unt.edu/search/?q4=%22Sandia%20National%20Laboratories%22&t4=dc_publisher&src=ark&searchType=advanced.